Solar water heating systems (known as solar thermal) use free radiation from the sun to work alongside your conventional water heater. They are designed to meet 100% of your water heating needs during the summer, but will require the backup from a boiler or immersion heater during winter. Solar thermal systems do not require bright sunlight in order to function; they simply require light and can still heat water even on a cloudy day as solar radiation is still present. The technology is well developed and an effective means of using solar energy in the UK. The key component of a solar thermal system is the ‘collector’. These can be either tube arrays or flat panels, and are typically installed in an array on the roof of the property. The collectors contain specially coated reinforced glass tubes to capture the radiation from the sun, which is then turned into heat. 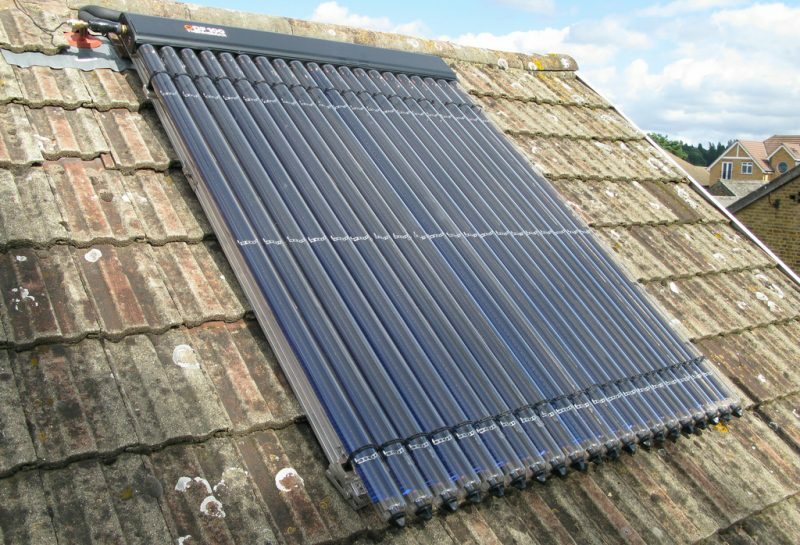 There are numerous solar thermal collectors on the market to choose from. We will help you select the very best collector panels or array for optimal performance and to suit each individual’s requirements in terms of water heating needs, property size and budget. To harvest solar heat a pump is used to transfer the heated fluid (normally a mixture of water and glycol) from your collector to a heat exchanger inside a water tank in your house. Typically you will require a specialised ‘twin coil’ water cylinder that contains both a coil heat exchanger for your free solar heat and a backup immersion coil that is connected to your existing boiler to provide water heating when required. Is my Home Suitable for Solar Thermal? Solar thermal hot water heating systems are definitely worth considering if you have a mainly south-facing roof or garden space with little or no shade. Although a south-west or south-east-facing location would also be effective. Shade on the collector panels at any time of day will reduce the performance. In addition to heating your home, they are particularly suited to heating swimming pools. Planning permission is generally not required for domestic solar thermal. Exceptions apply for listed buildings and buildings in conservation areas. The Met Office website has useful radiation maps. The higher the radiation figure, the greater the effectiveness of your Solar Thermal system. Even though these panels can be more expensive they utilise a vacuum to retain heat in the system. The panel comprises a number of individual tubes, each being separately sealed and containing a small amount of a fluid. Heat is extracted by evaporating the fluid in the tube which then condenses at the top, releasing the heat to the fluid circulating in the closed loop. The delivery temperature for evacuated tubes is higher than conventional flat panels and they operate more efficiently. Solar thermal flat panels offer far greater installation flexibility as they can be integrated into the roof for a neater installation. Also, they tend to be more robust and are generally considered more aesthetically pleasing. The collectors work by circulating water through the whole panel, but consequently they can be less efficient when compared to evacuated tube types. Contact us today and we will arrange your free initial site inspection as soon as possible to assess your property’s suitability, and discuss all of the Solar Thermal options available to you. Most systems have an average lifespan of over 20 years and require very little maintenance. A yearly check by the householder should be supported by a professional solar thermal service every 3-5 years to keep your system performing optimally. With extensive experience in the design, installation and maintenance of solar thermal systems over the years we have gained a good understanding of what is required to keep thermal systems operating correctly. Abel Environmental Services Limited are specialists in air conditioning and renewable energy solutions for both commercial and domestic customers. We were established in 1988 and are a family run business based in Romsey near Southampton, Hampshire. Fitting new air source heat pump and cylinder with heatmiser controls. © 2018 Abel Environmental Services Ltd.
Website made with by Thrive Digital.